I had a session with a Physio recently. I’d gone with the issue at hand being a torn calf muscle and—very rapidly—he told me that my problem was one of posture and poor muscle structure around the hips. He is probably right and I now need to re-discover some muscles I have clearly lost touch with. I have surely been able to twitch a single muscle as he demands; surely I can do that with some muscles, but how I learn to do the few he is pointing to is a new experience. One that stretches the bit of the brain that identifies where to send a signal, not just the failing muscle. 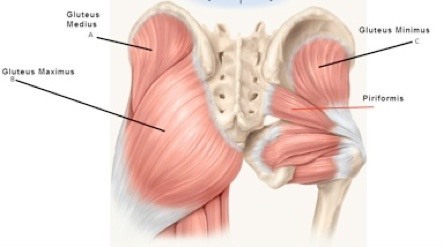 I am to work on the gluteus medius and maximus, the transverse abdominis and the multifudus; at the same time I am to stop twitching the quads, the well-hidden six-pack and anything that might be used for locomotion rather than stability. Not confusing, just really hard to do. Locating pics are on the right, I think. One of his comments was that he has a lot of business created by parents worried about the poor posture of their children, which he called Xbox posture¹. Clearly, we spend too much time seated and too much of that sitting badly. A suggestion he made was that I set the car mirror so I see well out of the back only when sat ‘upright’². Contributory factors to poor posture are lots of sitting – the wiki article³ cites clerical workers and drivers with one result I noted being a forward tilting of the hips, an increase in the curve of the lumbar spine, and a protruding stomach. ... Some of the classic signs of poor posture include having a pot belly, rounded shoulders, and a jutted out neck and chin. 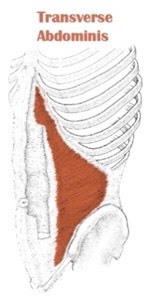 Pot bellies result when the lower back experiences an exaggerated curve, thus pushing the internal organs, in the abdominal region of the body, toward the anterior of the body. And there was me thinking the pot belly was all about beer. Extracting some points form the wiki article, hopefully not spoiling the meaning by adjacency: Many athletic injuries are the result of poor posture. 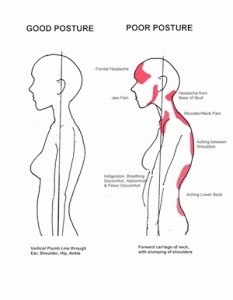 Poor posture is a physical as well as an emotional problem. It affects mood, confidence and how one is viewed by others. Most communication is associated with body language. Posture is a key aspect of body language. Emotions, as wells as physical activities, affect the state of one's posture. Sitting for prolonged periods is a great hindrance to good posture. Poor sitting posture is hard to rectify. Backpacks and computer use are associated with spinal distortions. • it causes premature ageing (no it doesn’t, unless what is meant is that the extra sunshine is bad for you). Perhaps the site is not taking this seriously. Many of these criticisms are avoidable and can be challenged for greater meaning. For example, there are some assumptions that the body has an expected number of heartbeats, muscle contractions & joint flexures and the body starts to fail once your allowance is passed. So you modify activity and training to accommodate this. I see no recognition that the body responds to exercise (especially when growing, surely) in what I found to read. 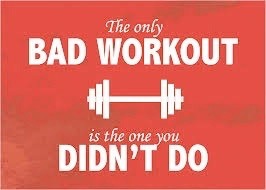 It may be that it is not exercise that is bad for you, but what you choose to do for exercise and how you do that⁵. Such as using just a few muscle groups (your thumbs, your jaw). Over-use injuries follow, as do what I might call ‘style’ injuries (lifting badly, running badly, poor equipment, bad advice, bad habits, etc). Doing the one activity (say running, or cycling) makes you good at that one activity but it actually encourages other muscle groups to fail (misbehave, perhaps) unless there is an element of cross-training (simply, variety). So the mono-athlete (the single-sport devotee) should also go to the gym, go swimming, play squash, walk on rough ground, etcetera, so as to defend against a variety of injuries. At the same time, clearly there is a style element to study – not just “Can I go faster?”, but questions such as “Can I get the same result with less work?”, “Can I do this better?”. In such a case, we would need to wonder what we meant by ‘better’; I suggest it means anything with fewer bad effects (injuries especially). This apparently runs counter to ‘no pain no gain’, but I think I disagree. If every training session runs up to the pain barrier then something is wrong (and you’re a masochist). We have been discussing (well, I have) whether running training would improve if we alternated long and short and the evidence is affirmative. Unfortunately what we want to do (go running) and what we should do (a track session, a swim, a gym session) are not the same. It is only after being injured that we sometimes take heed of such advice. That is not to say that doing a wide variety of activities (sports) prevents injury, but I suggest that the exercise-related injury is largely avoided by a greater range. My own injuries while teaching (3-5 sports in a week, 5-15 sessions) where far more to do with impact or illness than with excess. Running related injuries were far more likely when I was only running. Similarly for squash, soccer and rowing. Healthline⁶ supports the thesis that many sport-related injuries can be avoided by proper training. Clearly proper training results in no injuries, then. Begone, ‘no pain no gain’? What about diet? I found many sites telling us the message I put in the top picture. 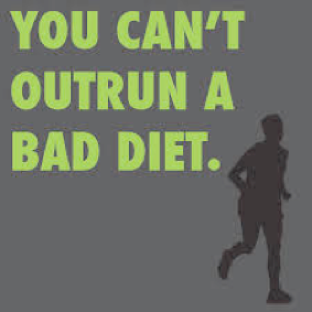 This is especially true for those of us wishing a flat belly. Hundreds of sit-ups won’t make that last bit of fat go unless accompanied by a diet that reduces body fat. The exercise has to balance the work output (‘cheat meal’ is a useful phrase). Low body fat may not be a good thing in the winter – you’ll get cold easily and/or you need even more exercise to be warm. Stressing the body (just enough) causes the body to burn off available fat and I found in an earlier essay that doing ‘just one more’ until you really can’t will push the body into burning off the fat. Of course, one then goes and spoils all the work by then eating too much of the wrong stuff that puts the excess flesh all back with interest. I note that what I’ve written about here is mostly about physical training, yet increasingly—and definitely for those of us at the older end of the age range—we are encouraged to work on maintaining brain activity. It is recognised that physical well-being does the brain a load of good, basically because anything that moves the blood around (more) is good. In order to avoid the spectre of Alzheimer’s we are encouraged to stay well away from diabetes⁷ (diet, exercise) and we should be doing ‘brain training’ to keep ourselves on top of our game. As with dieting there is suddenly an awful lot of stuff to wade through a lot of which is froth, a lot of which is expression of vested interest and, once past the echo-chamber effects, there is a small amount which is actually useful. Exactly as with dieting⁸, it is very hard to tell which is the small fraction of genuinely valuable material; exactly as with dieting, what we are told is important is subject to change. 1 if you use Xbox, then Xbox posture is something to do with the way you setup the software, not how you sit while playing. 2 One of the few things I’d criticise in our current car is the seat. I can’t remain comfortable for much more than an hour and at two I really don’t need any reminding to have stopped. Even with a stop included, I’m fidgeting badly at four hours. The seats in the RX-8 were sweaty but otherwise great for six hours and only uncomfortable after eight. 6 http://www.healthline.com/health-news/why-too-much-exercise-can-be-bad-042514 reports (i) the biochemistry that causes fatigue (but that doesn’t tell you anything except what to call it) and (ii) a correlation between wealth and over-use injury – faulty reporting, I’m afraid; the wealthy produce more health insurance claims, which looks like ‘more’ injury. 8 Example: is it saturated fat or unsaturated fat that is ‘bad’ for you? There are articles arguing each side, so whatever the science is, it is either not understood or there is spin being applied. If you can discern which is the truth, then write BUT please look first for yourself to check that your opinion is supported by evidence. How can there be diets that suggest that if we eat sufficient vegetables in our meals, we can eat anything (provided the total volume isn’t too high). How is it that so many of these diets are still so bad we need supplements? What are the thresholds at which things become ‘bad’ for us? Example: I found a site telling me I should never eat bananas, but there are many telling me bananas are the source for the potassium I should be returning after violent exercise. So, in or out? Example: a single glass of red wine per day may well be good, but three is probably bad. This is what I would call useful information, once supported by evidence and explanation.